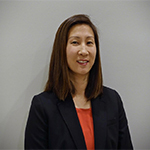 Carolyn Bae currently serves as a Clinical and Analytical Program Specialist. Dr. Bae completed her Doctor of Pharmacy degree at the University of Michigan and additional residency training in an ASHP accredited pharmacy practice residency program at the Detroit Medical Center. In addition, she obtained masters level training in biostatistics at Columbia University. She is a Board Certified Pharmacotherapy Specialist and has practiced clinical pharmacy in five states and is a member of the American College of Clinical Pharmacy. Dr. Bae began her first clinical management position as Director of the Drug Information Center at Temple University Hospital in Philadelphia, PA. She continued her practice in the area of drug information as the Drug Information Center Manager at the Weill-Cornell Medical Center and eventually created their affiliate Drug Information Center at the Columbia University Medical Center. In her years of tenure with the New York-Presbyterian Hospitals at the University Hospitals of Columbia and Cornell she provided management and oversight for many institutional formulary committees, medication safety committees, and academic committees and served as the Director of Pharmacy Continuing Education. Dr. Bae formerly provided clinical pharmacy expertise for a supply chain management organization as Senior Clinical Manager for Novation, LLC. In this position she provided clinical support to business units in contracting activities, evaluated clinical information for pipeline drugs, supported member hospitals in optimal clinical and economic use of medications and authored clinical information for the company’s member-use website. Dr. Bae has extensive experience in academic settings and has served as a clinical instructor for Temple University, Creighton University, St. John’s University and a guest lecturer at other major institutions such as Drexel University and Arizona State University. Her academic credentials also include development of an inter-professional graduate level collaborative clinical curriculum with the University of Arizona College of Medicine, Arizona State University School of Nursing, Arizona State University School of Social Work and the University of Arizona College of Pharmacy. Dr. Bae also has significant experience in prospective and retrospective drug utilization reviews as well as data mining for drug safety evaluation and other analytical and research studies. She has presented numerous research findings at national medical meetings on various clinical topics.